A plant’s defense mechanisms against pathogens are very different from the human immune system. Plants are able to take molecular pieces of the intruding viruses and turn them against the virus. 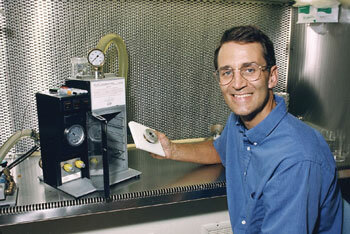 This concept is called “pathogen-derived resistance,” and was first proposed in 1985 by John Sanford and S. A. Johnson. Sanford was also a faculty member at Cornell’s Agricultural Experiment Station in Geneva, NY, and worked in a building less than 100 yards away from Dennis Gonsalves’ lab. The concept of pathogen-derived resistance was confirmed in 1986 when scientists were able to engineer tobacco and tomato plants to express a fragment of the tobacco mosaic virus, thus rendering the plants resistant to the virus. The virus-resistant papaya owes its defense against PRSV to a particular kind of pathogen-derived resistance, called RNA interference (RNAi), which works as a natural plant defense mechanism against viruses. Most organisms use DNA (deoxyribonucleic acid) as their genetic material but viruses use RNA (ribonucleic acid) to invade an organism’s cells and co-opt the cellular machinery there to replicate themselves and spread throughout the host. When a plant uses RNAi, it uses part of the virus to shut down the virus’s method of replication. As a result, the plant remains healthy. Exactly how RNAi works was not understood until Andrew Fire and Craig Mello studied its use for human gene therapy. For their efforts, they were awarded the Nobel Prize in Physiology or Medicine in 2006. Another essential component for how to develop a PRSV-resistant papaya also originated from the Sanford lab where colleagues had the bizarre idea of “shooting” DNA into a plant cell so the plant could incorporate the genetic material into its genome. The prototype tool they tested was a Crosman air pistol — essentially a BB gun — modified to fire dense tungsten particles coated with DNA into plant cells in a petri dish. The cells were then collected and tested for successful integration and expression of the new DNA. Surprisingly, the so-called “gene gun” worked! Using traditional horticultural methods, the modified plant cells were grown into full sized plants that expressed the desired trait, such as resistance to a plant virus. Gonsalves was trained as a traditional plant virologist, and not as a “gene jockey,” but he saw the potential of what Sanford’s team was doing and how the technology could be used to help the beleaguered papaya growers. He approached Sanford about producing PRSV-resistant papaya. 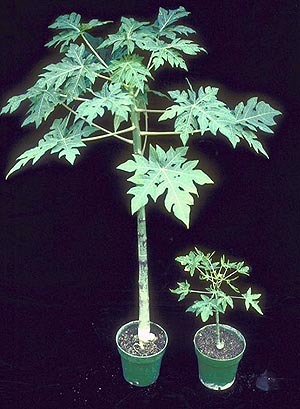 In 1991, in greenhouse tests at Cornell, Gonsalves and his team of scientists from the University of Hawaii and Asgrow Seeds confirmed they had transformed a salmon pink-fleshed ‘Sunset’ papaya into a plant resistant to the Hawaiian strain of PRSV. The GE plant, identified as line 55-1, was multiplied so it could be field-tested. The Animal Plant Health Inspection Service (APHIS) of USDA approved a 1992 field trial in Puna that demonstrated resistance of GE papaya to virus infection in the open field. Further breeding work with line 55-1 was done to develop the orange flesh ‘Rainbow’ and pink flesh ‘SunUp’ varieties, which were field tested in Puna in 1995. Both showed resistance to PRSV and excellent horticultural characteristics including color and taste. Next, Gonsalves and his colleagues had to figure out how to get the new fruits to growers. That step required knowledge about intellectual property (IP) law and how to commercialize a GE product. Those working with GE orphan crops such as papaya often find that necessary pieces of technology are held as IP by other scientists and institutions. To create GE papaya for research purposes, Gonsalves needed about a dozen pieces of IP held by different parties, including genes from the Massachusetts Institute of Technology and Oregon State University. For the original research, Gonsalves received the necessary IP through no-cost material transfer agreements, a common way that members of the scientific community help each other in the pursuit of knowledge in the public interest. However, the commercialization of GE papaya was liable to be different: IP holders were likely to demand a share in any profits. 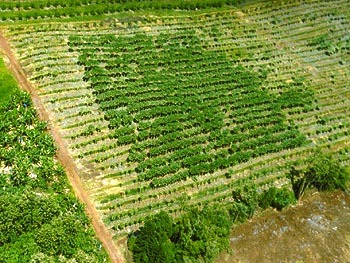 Despite some preliminary profit-sharing negotiations, GE papaya was ultimately distributed to the Hawaiian papaya growers free of charge. In large part the boon was thanks to Hawaii’s senator, Daniel Inouye, a strong supporter of Hawaiian agriculture who served for four decades in the U.S. Senate. The idea of distributing free GE papaya seeds pleased Gonsalves since his plan was that this would be a philanthropic effort. He wanted to “do something to help people,” as his mentor advised. The thousands of dollars Cornell spent on legal fees to negotiate the IP landmines were absorbed as operational expenses of a Land Grant university pursuing knowledge for the public good. To finalize the task of distributing the seeds to the growers, Cornell turned over the final IP negotiations to the Hawaiian Papaya Administration Committee, which hired its own lawyer. With GE papaya on the road to commercialization, Gonsalves still had to satisfy the requirements of the three US federal agencies that regulate GE crops — the Environmental Protection Agency, the Food and Drug Agency, and the USDA. Unlike large corporations with deep pockets for funding regulatory submission packages for product approval, Gonsalves and his small team of scientists did this on a minimal budget and worked largely pro bono. The three agencies approved line 55-1 (the transgenic parents of ‘Sunup’ and ‘Rainbow’) in 1997 and the first seeds were provided to growers on May 1, 1998. Sixteen years later, the GE papaya used by Hawaiian growers remains resistant to PRSV. However, a totally different type of resistance developed in the form of two councilwomen and a number of organizations, including “GMO-Free Hawaii,” that led the crusade against GE crops on the island that resulted in the 2013 legislation.